Breakfast is an important part of our family’s day. I have two little boys who can eat as much as grown adults. Often on play dates, I pray that no eating will be involved. It’s silly, but the amount of food my little munchkins can put down always blows our new friends’ minds. Family members sit and watch our children eat in utter amazement and wonder aloud where the food goes! Keeping my boys fed is a challenge for me. Quite honestly? It’s one of the hardest parts of parenting for me right now. Saying that out loud feels so silly. I’m sure there are harder parts of parenting, but right now, this is just where I’m at. Anyway, back to breakfast. Because my family requires a lot of food throughout the day, I’m always on the lookout for super filling, nutrition-packed breakfast ideas. One morning while doing the Whole 30 Challenge, I woke up in desperate need of something other than scrambled eggs, fried eggs, hard-boiled eggs, or … oh the amount of eggs we consumed on this challenge! So I did something quite typical and created something that sounded good in my mind. And out came one of the most memorable breakfasts we’ve had to date. The only complaint I received was that I didn’t make enough. Go figure! Quite the accolades for a sleep deprived mama! The best part? I didn’t have to feed them a single snack before lunch! 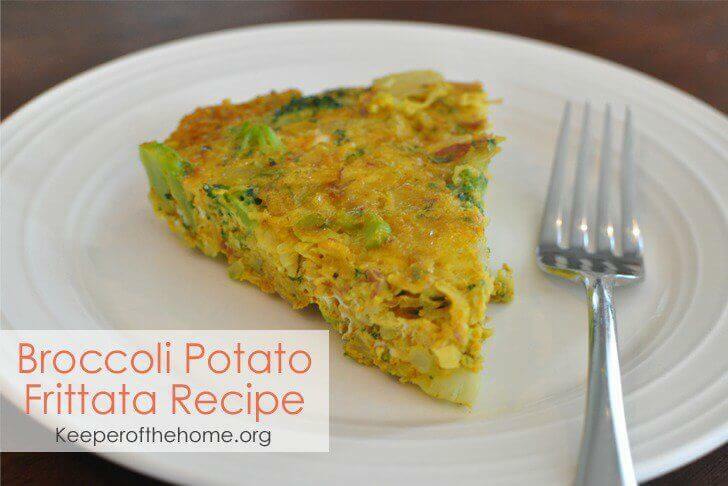 This Broccoli and Potato Frittata kept my boys full and satisfied all morning. Score! If you’re looking for a simple recipe that packs a bunch of nutrition to add to your breakfast recipe list, then add this one. You won’t regret it. It’s delicious, simple to make, and did I mention delicious? Just checking. , melt your coconut oil over medium-high heat. Add the onion and cook until translucent. Add the garlic and cook for 30 seconds to 1 minute. You want to get that nice garlic aroma without burning the garlic. Toss your broccoli into the pan and continue cooking for five minutes or until your broccoli is soft. In a separate bowl, whisk together the eggs, cream, water, salt and pepper, and turmeric. Stir in the shredded potato. Once your broccoli has softened, pour the egg mixture into the hot pan. Give it a quick, gentle stir and sprinkle parsley lightly across the frittata. Then, let it sit on the heat for two minutes or until the edges start to set. Turn your burner off and pop the skillet into your preheated oven for 15 minutes or until eggs are cooked all the way through. What is one of your favorite breakfast recipes? Disclosure: This post contains affiliate links. When you buy through our links, we earn a small commission, which helps to keep this site going so that we can continue to offer free and useful content, so thanks! Definitely trying this! I can relate to feeling like you’re always needing to feed someone! My husband works from home so we usually have three packed meals a day. And yep. We go through a LOT of eggs!